The volunteer training will be conducted in two stages this year: child retardation assessments and oral examinations will be done on October 8 and October 22, respectively; child occupational therapy and dental hygiene with basic childcare concepts and skills will be on November 5 and November 19, respectively. 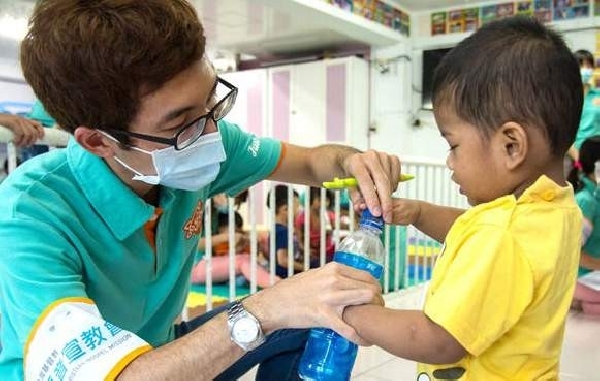 Pharmacist Hsuan-Ting Teng, the representative of the medical group at the Harmony Home and Love, mentioned during an interview that the best attribute of medical students is their passion for helping others. With the mentality of loving lives, Peace Medical Corp enjoys charity and offering free medical consultations. It is this mentality that has drawn medical students there. While the volunteers from Peace Medical Corp interacted with the children, they could see that the kids clearly suffer from serious growth retardation problems. Although these children have reached the age of expression through conversation, many of them still expressed their moods through hitting, biting, and crying; they even had difficulty following body movement instructions. It was truly heartbreaking. However, after two meetings at the Harmony Home, some children have slowly improved when volunteers tried to give them instructions! Although the improvements and changes are small, we believe that bigger changes will occur if we are persistent. Besides medical consultation and guidance, the volunteers also pray for these children, hoping that they would be able to feel the Lord’s love.